Sporty and very popular. 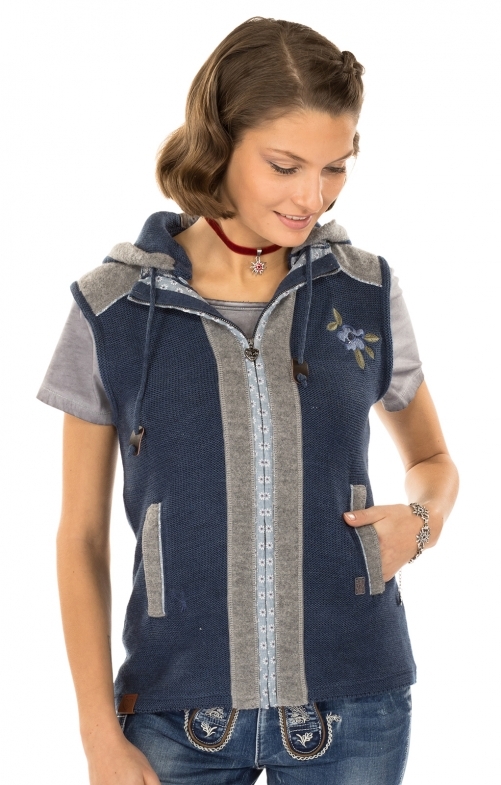 The traditional costume vest with hood colour denim blue. Young fancy styling by Spieth and Wensky. High-quality knit in combination with Walk in the combination strong colour jeans blue and grey. Practical zip at the front with small metal heart. 2 side pockets. Zip trim with contrasting cotton trim and lapel detail loosen the front and match the colours of the floral embroidery designs on the back. The hood belongs to it and can be adjusted over a drawstring in the width. Sporty on the one hand. On the other hand romantic playful. The strong impression of this special national costume vest is exactly in it.